The New State-of-the-Art in Information Security: Now Covers Cloud Computing, the Internet of Things, and Cyberwarfare IT and security professionals and students have long relied on Security in Computing as the definitive guide to computer security attacks and countermeasures. Now, the authors have thoroughly updated this classic to reflect today's newest technologies, attacks, standards, and trends. 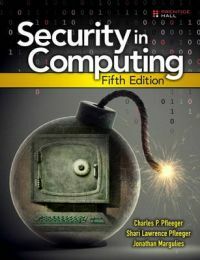 Security in Computing, Fifth Edition, offers complete, timely coverage of all aspects of computer security, including users, software, devices, operating systems, networks, law, and ethics. Reflecting rapidly evolving attacks, countermeasures, and computing environments, it introduces up-to-the-minute best practices for authenticating users, preventing malicious code execution, using encryption, protecting privacy, implementing firewalls, detecting intrusions, and more. Combining breadth, depth, and exceptional clarity, Security in Computing, Fifth Edition, builds carefully from simple to complex topics, so you always understand all you need to know before you move forward. You'll start by mastering the field's basic terms, principles, and concepts. Charles Pfleeger is an internationally known expert on computer and communications security. He was originally a professor at the University of Tennessee, leaving there to join computer security research and consulting companies Trusted Information Systems and Arca Systems (later Exodus Communications and Cable and Wireless). With Trusted Information Systems he was Director of European Operations and Senior Consultant. With Cable and Wireless he was Director of Research and a member of the staff of the Chief Security Officer. He was chair of the IEEE Computer Society Technical Committee on Security and Privacy. Shari Lawrence Pfleeger is widely known as a software engineering and computer security researcher, most recently as a Senior Computer Scientist with the Rand Corporation and as Research Director of the Institute for Information Infrastructure Protection. She is currently Editor in Chief of IEEE Security & Privacy magazine. Jonathan Margulies is the CTO of Qmulos, a cybersecurity consulting firm. After receiving his Masters Degree in Computer Science from Cornell University, Mr. Margulies spent nine years at Sandia National Labs, researching and developing solutions to protect national security and critical infrastructure systems from advanced persistent threats. He then went on to NIST's National Cybersecurity Center of Excellence, where he worked with a variety of critical infrastructure companies to create industry-standard security architectures. In his free time, Mr. Margulies edits the "Building Security In" section of IEEE Security & Privacy magazine.